Heartiest congratulations to our senior girls, Emily Farrell and Rachel Lyons who participated in the Soroptimist public speaking competition this week. The event was held in Athlone Community College on Tuesday night, with several schools from the locality participating. The competition was steep with an excellent display of knowledge, skill and ability by all the girls' involved. Rachel Lyons 5th year will go forward to represent the region in the Leinster final in January. We wish her every success in the next round. Thanks also to their mentor Ms.Ruth Gaffney. Alan Devine has completed his workshop with three TY groups, and our public speaking soroptimist team of Emily Farrell (6th year) and Rachel Lyons (5th year). The workshop gave tips on gaining confidence in public speaking. 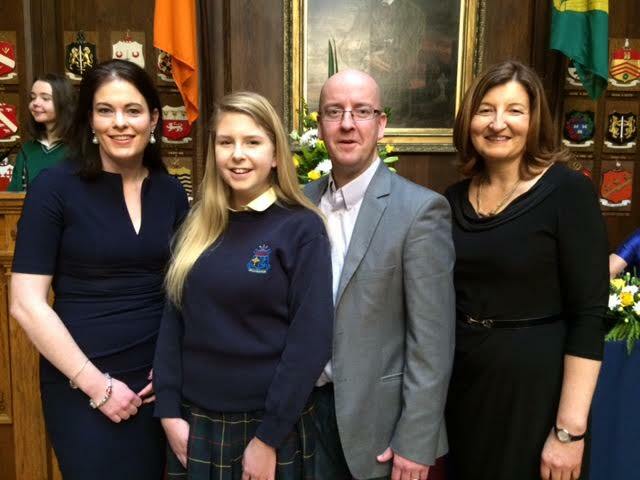 Well done to Emily Farrell transition year who competed in the All Ireland final of the Soroptimists Public speaking competition on Saturday March 5th which was held in the Mansion house Dublin. Emily was one of eight National finalists and she spoke on the topic of "Empowering Women". She performed very well on the day, delivering a flawless "Prepared" speech and also excelling in her "Impromptu" speech on the topic " being young is over -rated".One overall winner was announced and even though Emily did not take home the trophy on this occasion, we are all very proud of her achievement in getting this far in the competition and the way in which she represented the school. Sincere thanks also to Ms. Gaffney who worked with Emily as she prepared for the competition and Ms. Donohue and Ms Cribbin who accompanied Emily on the day. and she spoke on the topic of "Empowering Women". At the recent regional final of the soroptimist public speaking competition Emily Farrell & Emer Tyrell did both themselves and Mercy ballymahon very proud. Emily will go on to represent the region in the All Ireland final to be held on sat 5 th March in the Mansion house Dublin. "Girls, who have skills, education & decision-making power, make greater contributions to their communities and families". We wish Emily and her mentor Ms Gaffney the very best of luck.